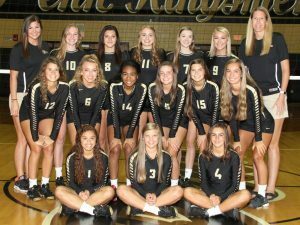 The Kingsmen volleyball team once again swept another conference opponent, storming past the Falcons of Glenn on Thursday, Sept. 28. The Kingsmen beat the Falcons by scores of 25-12, 25-10, 25-12. Julia Beers and Rachel Hickey led Penn with 13 kills each. Rachel Ruppert powered the Kingsmen with 11 kills. Alyssa Torres and Italia Fields had 10 kills each. Naomi Willis directed the Kingsmen attack with 34 assists.